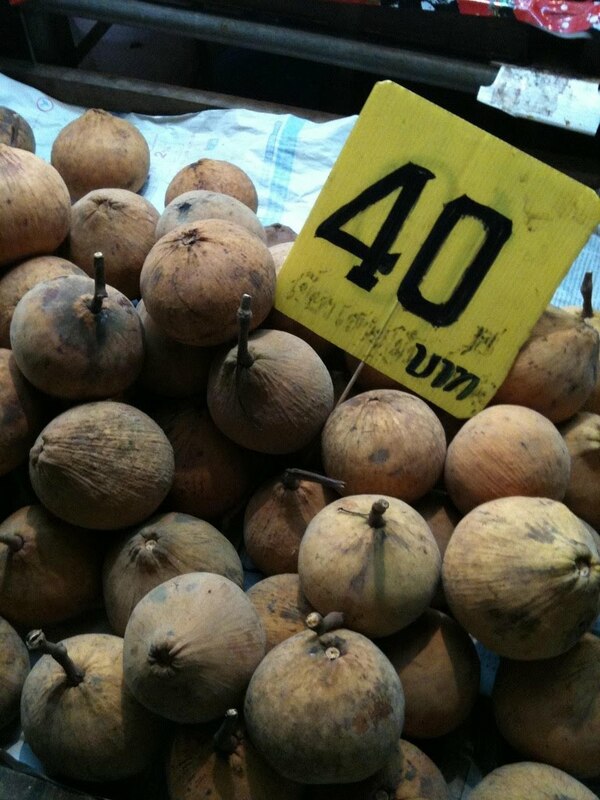 In Thailand and Malaysia, there is no shortage of sumptuously ripe fruit. Mangoes drip with juice that's almost like honey. Papayas practically melt in the mouth. Kiwis are the same vibrant green as the litlle lizards that dash and skitter along the walls. Coconut water and coconut milk are pervasive. I've had a bit of fruit education, too, trying for the first time rambutan, mangosteen, dragonfruit, jackfruit, rose apple, a different varietal of orange that's small, perfectly round, green on the outside, and tastes similar to a tangerine. Unripened guavas are served precut in a plastic bag as street food with chilis, spices, and crushed peanuts to mask their sour-bitter flavor. Like the seasoned guavas, almost any fruit you can think of can be found peeled, precut, and ready to eat on the street, including pineapple, watermelon, and lychee. In Panang, we ate a special dish called Rojak, which is a plate of fresh fruit cut into bite-sized pieces and drowned in a thick, dark, and sticky sauce, the color and consistecy of a very dark chocolate sauce, sprinkled with peanut meal. We had it at an outdoor food market at midnight, when many of the other stalls were closing; but this tiny food cart had a line of about 7 or 8 patient locals waiting for their rojak. The sauce is clearly what makes rojak special, but the mix of fruits is refreshing too, blending bitter (bitter melon), sour (something like a very tart kumquat) sweet, mild, juicy, soft, crunchy (there are oblong crouton-like pieces as well), sticky, and smooth all together. Another fruit I tried for the first time is one whose name I have yet to learn in English. A Thai man called it kathong. It's the size of an apple but more closely resembles an oversized, beige fig. It tastes as if it might belong to the squash and melon family, teasing my tongue with a memory of raw pumpkin. Boyfriend said he noticed the faint taste of basil, and I did too after he said that, something herbaceous but distinctively basil-like. If anyone knows this fruit's common English name, I'd love to know it!